This is the second nail design from my nail art Halloween series, to see the first design click here. I wanted to make a french tip Halloween look so I came up with a black kitten tip with a purplish blue night time background and a moon on the ring finger. I hope you enjoy the tutorial. What I used: OPI's I don't give a Rotterdam, a white nail polish, Zoya's Gaia, a black nail polish, a art deco yellow polish, Sally Hansen's insta-dri anti-chip top coat, dotting tools, and some nail brushes. Step 1: First apply two coats of whatever nail polish you are using for the background. 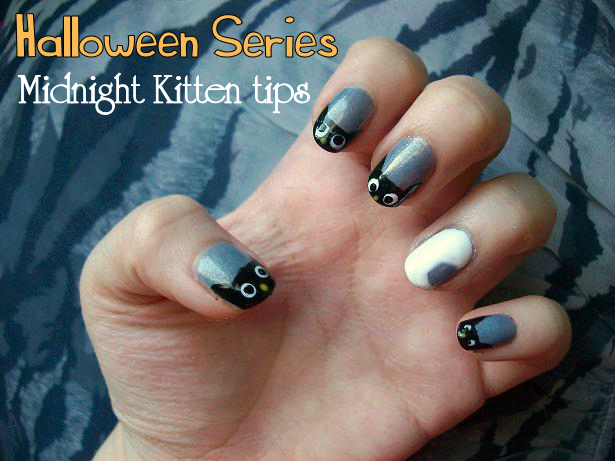 Next using a black nail polish make a cat's head outline on the top of your nail tips. Repeat on each nail besides the ring finger. Step 2: Fill in each cat outline that you just made. Step 3: Now it's the fun part, drawing in the kitty cat faces! I used a nail dotting tool and white polish to create the eyes and art deco's yellow polish to create the nose. Step 4: For my ring finger I drew a crescent moon shape. 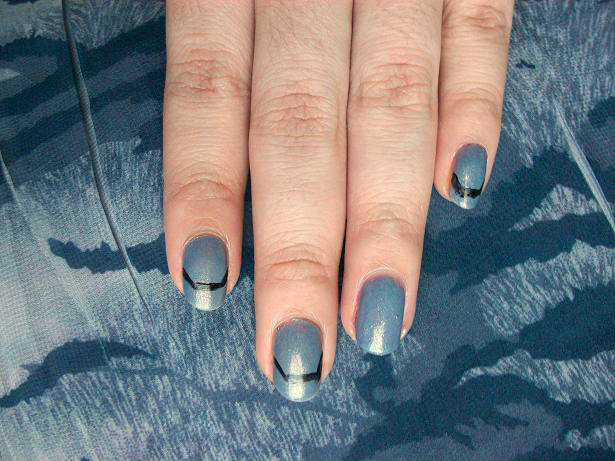 To make the moon I used a white polish to make the crescent outline and then filled in. 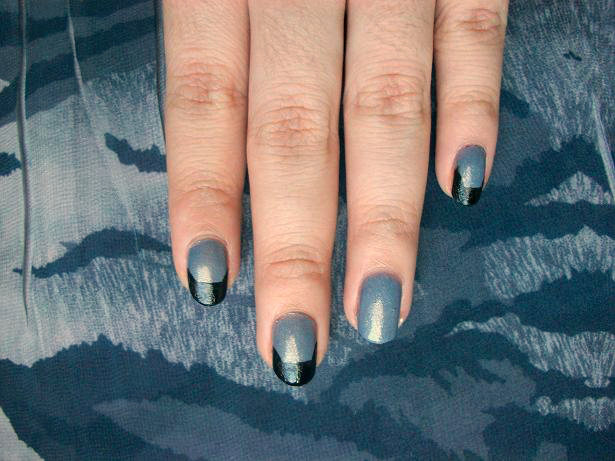 Later I then applied Zoya's Gaia to give it a opalescent look. Step 5: Apply a top coat to finish. 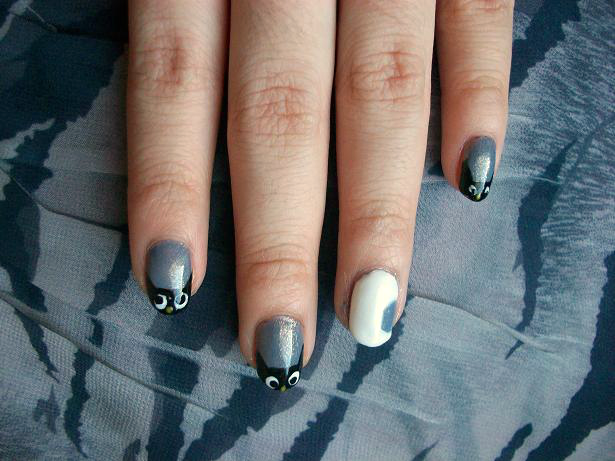 You now have a cute but still appropriate for Halloween nail look. 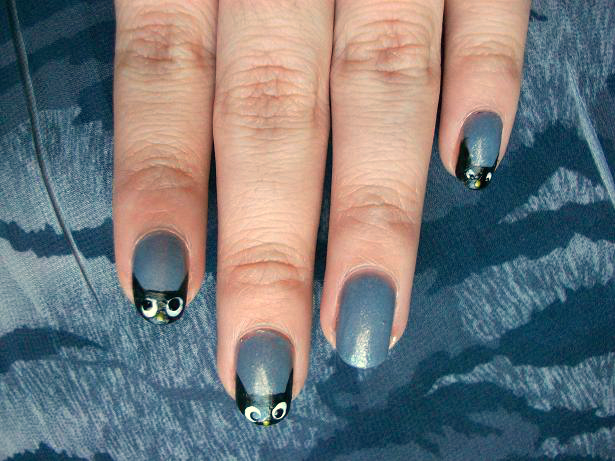 Will you be trying out this nail look for Halloween?